A diminutive and suspicious man who appears in Aladdin's house to escape the Heartless moving about the city, but quickly enough sets up a shop within to aid the heroes. A diminutive shopkeeper with a disproportionate lust for all manner of riches. He manages to chase down Aladdin and Abu and take back the black lamp they stole, and upon overhearing the heroes speaking of their access to the Cave of Wonders, becomes unwilling to part with the lamp unless in exchange for unbelievable treasure. Sora and the group manage to obtain such treasure, and return to Agrabah to see the peddler and Pete fighting over the lamp. After defeating Blizzard Lord and Volcanic Lord, the trade is enacted, and Jafar's lamp hidden away within the royal treasure chambers. 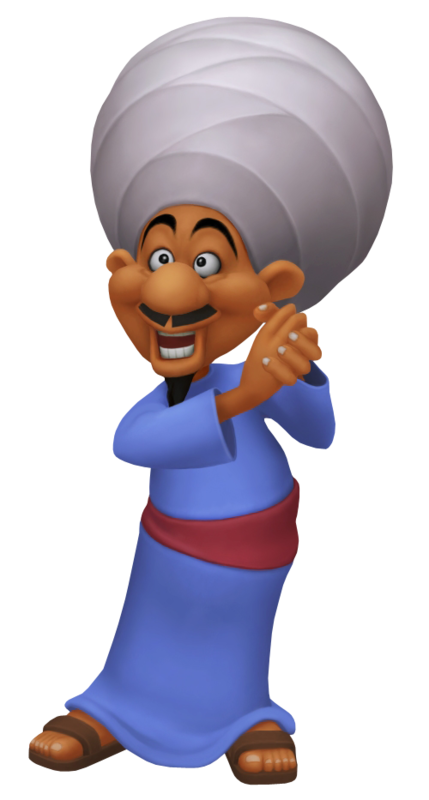 Acting under the hypnotic voice of Jafar, the peddler finds his way to the lamp and ultimately leads to him being released.